rec. Cadogan Hall, London, 23-24 January 2016; DiMenna Center, New York City, 23-24 May 2016. DDD. OR Warner Gemini 3814872 (download only, with BEETHOVEN Triple Concerto, MOZART Violin Concerto No.3 and PROKOFIEV Violin Concerto No.2) – review . Go for the Gemini, a 2-CD set costing little more than the single CD and preserving the Oistrakh/Kushevitzky/Oborin Beethoven Triple Concerto, conducted by Sir Malcolm Sargent. The Beethoven and Brahms coupling on a single CD (7628542, no longer available) is still my reference recording for both concertos. - Pentatone PTC5186066: Julia Fisher, Daniel Müller-Schott; Netherlands Philharmonic Orchestra Amsterdam/Yakov Kreizberg (with Brahms Violin Concerto) – review – Download News 2012/9. - Erato (formerly Virgin Classics) 3951472: Renaud and Gautier Capuçon; Gustav Mahler Jugendorchester/Myung-Whun Chung (with Clarinet Quintet): Recording of the Month – review – review – review. 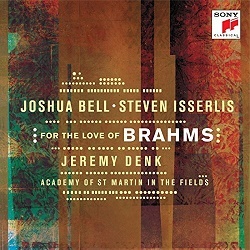 Joshua Bell and Steven Isserlis have performed the Brahms Double Concerto many times together, including a recent set of concert performances with the Academy of St Martin in the Fields, in which they also performed Britten’s arrangement of the slow movement of the Schumann Violin Concerto, and that sense of working well together is readily apparent from this new recording. No need for a conductor under these circumstances. I’ve been thinking a great deal about image in listening to this CD. We’re familiar with Schumann’s self-concept as a balance or struggle between two aspects, which he labelled the active Florestan and the passive Eusebius, but it seems to me that he and Brahms had more in common than a love of Clara, unrequited in the case of Brahms. It was the pairing of Brahms with the Schumann Violin Concerto on this album that first set me thinking along these lines and I was interested to see that Steven Isserlis in the notes has had similar thoughts. Listening to the new recording of the Double Concerto and comparing it with the other versions listed above, most of all Oistrakh and Fournier, added to the thought. Throughout the first movement there are numerous strands, possibly at least in part because this was the work which Brahms hoped would heal the breach with Joachim, a friendship dating back even earlier than his encounter with the Schumanns. An ideal performance would hold the powerful and athletic side of the music in balance with the more thoughtful, even wistful. Each of these would come to the fore in the remaining movements but they need to be in balance and in tension in that important first movement. It’s also important to keep the music moving. Otherwise, as with most performances of the Violin Concerto, the pensive Brahms seems to win over the active Brahms – that’s why I find only the Heifetz and Reiner performance of the latter really captures the work. Heifetz recorded the Brahms Double Concerto with Feuermann and Ormandy in Philadelphia (RCA, download only, or Naxos 8.110940 – review) and with Piatigorsky, the RCA Orchestra and Wallenstein (RCA G010003290587O or 09026635312, both download only). In both performances the first movement is kept moving at just over 14 minutes and just under 15 respectively and while the Heifetz Violin Concerto really works for me, even in the later recording with Piatigorsky and Wallenstein the agile, active Brahms is so much to the fore that the more thoughtful aspects of the music are less in evidence. I like performances which keep Brahms and Schumann on the move – no-one has bettered Szell’s recording of the Rhenish Symphony 1 which moved one reviewer to pun on a then-current advert for Shell, ‘that’s Szell, that was’ – but there’s too much movement in this performance of the Brahms Double Concerto. Jonathan Woolf reviewing Fischer, Müller-Schott and Kreizberg on Pentatone was decidedly unimpressed by the Violin Concerto but had better things to say of the Double Concerto – review. I had my usual reservations about any version of the Violin Concerto where the first movement runs to over 23 minutes but overall liked that recording a little better than my colleague, though I think the Penguin Guide **** rating over-eggs the pudding 2. Listening again immediately after Heifetz and Piatigorsky they sound under-nourished, an effect emphasised by the fuller 24-bit recording as against the typically bright RCA. It’s an unfair comparison, of course, playing one straight after the other, but it does point to the divide between how different performers stress or reconcile the active and passive aspects of the music. Which brings me back to the difference between my long-standing version of choice from Oistrakh and Fournier and the new recording. Both adopt a sensible tempo for the first movement, a compromise between the Heifetz recordings and the rather dreamy tempo of the Capuçons and Chung, and both contrive to keep both the tension and the balance between the two aspects of the music. If Oistrakh and Fournier tilt the balance a little in favour of the introspective and Bell and Isserlis in favour of the extrovert – try the two openings to see what I mean – both offer versions with which I can happily live. The Academy of St Martin may be smaller than most of the orchestras who have recorded this work but that allows an ideal combination of chamber-scale intimacy and strength. Nor did I find myself wishing for a conductor to hold the plot together, as another reviewer did. After all, the ASMF are quite used to taking Joshua Bell’s lead, as I assume to be the case: he has been their director since 2011. There’s just room for both CDs to live side by side in my overcrowded collection, too. The Warner set comes with an equally fine performance of the Beethoven Triple Concerto. At the risk of seeming constantly to recommend a kind of ‘These you have loved’ of vintage recordings – guilty as charged – I must mention the recording from which I got to know that concerto, from Wolfgang Schneiderhan, Pierre Fournier, Géza Anda, and the Berlin Radio SO conducted by Ferenc Fricsay, released in 1961 and still available on DG Originals 4775341. Still very much worth having, that’s coupled with a Brahms Double Concerto from a year later with Fournier and János Starker, still worth hearing but less recommendable, perhaps because Fricsay was by then terminally ill. The Pristine Audio transcription of the Beethoven, reviewed by Lucy Jeffery, was not available when I checked but that seems to have been due to website maintenance. It’s still listed in their catalogue, with bonus download-only tracks. Joshua Bell has recorded the Schumann Violin Concerto complete: it remains available with his recording of the Brahms and Tchaikovsky Violin Concertos on an inexpensive Decca 2-CD set (4756703). With the Britten coda here it makes an interesting stand-alone work and there’s plenty of wistfulness in the performance. I do urge those who have written the work off, as Clara and Joachim did, as a work of incipient madness, to listen to the concerto complete, perhaps in the newish Harmonia Mundi recording with Isabelle Faust as soloist – review. For reasons cogently given in the booklet Joshua Bell and his partners have chosen to record the first (1851) version of the Trio. It may be fanciful to read into that earlier edition hints of the impending crisis in the household of his friends Robert and Clara Schumann and the hopeless love which Brahms was to nurture for Clara but it’s a more tempestuous work than its later thorough revision. It’s as if, as Steven Isserlis puts it, the later Brahms was trying to erase his own youthful image with that of the bearded elder with which we are more familiar. It’s very hard for those of us nurtured on the original Percy Scholes edition of the Oxford Companion to Music to put aside Batt’s drawing of the elderly and bearded Brahms smoking a cigar and pouring yet another cup of strong coffee. The Trio receives a first-class, intense but not exaggerated performance here: in many ways this is as attractive a feature of the new recording as the other works. It will, however, in all likelihood make the listener who has not yet done so wish to explore the complete Brahms Piano Trios and they don’t come much better than on a budget-price Hyperion Dyad twofer, performed by the Florestan Trio and coupled with the Clarinet and Horn Trios – Reissue of the Month: Download News 2014/4 . That remains my first choice: see my comparison with more recent versions on Sony/RCA and Ondine – Download News 2015/6 . The Hyperion is an inexpensive way of obtaining the complete set and comparing the original version of No.1 on Sony with the snappier revision (CDD22082: CD for £8.40 or download in mp3 or lossless for £7.20 from hyperion-records.co.uk). The recording is very good. I’ve already made clear my debt to the very valuable notes but I do wish they had been printed in a less minuscule font. Subscribers to Qobuz and Naxos Music Library are urged to stream this recording but I can’t recommend downloading from Qobuz when you should be able to find the CD for less than their £12.89: it’s on offer at present for as little as £9.99 and $13.99. Having sampled it, perhaps in comparison with other recordings available on both sites, be prepared to find yourself placing an immediate order for a CD which very narrowly failed to make it as a Recording of the Month.